I promised you in the last post that this time it would be a little bit more interesting. 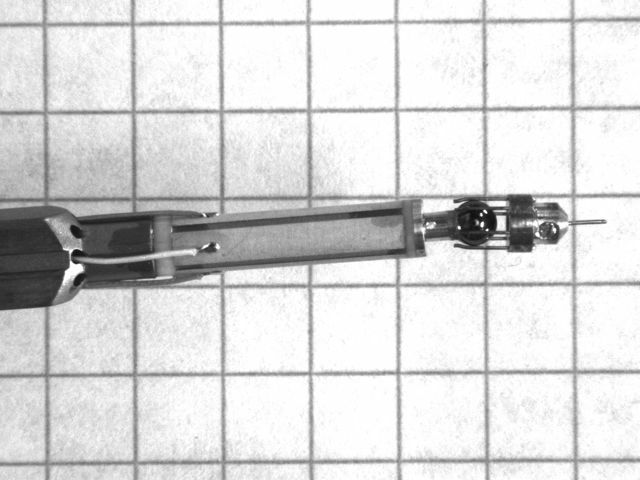 This is a post about the new control system for the in-situ TEM probe that just recently has been developed, figure 1. 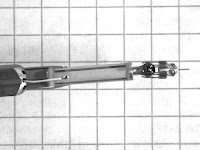 Figure 1, (left) the in-situ TEM probe from Nanofactory instruments. 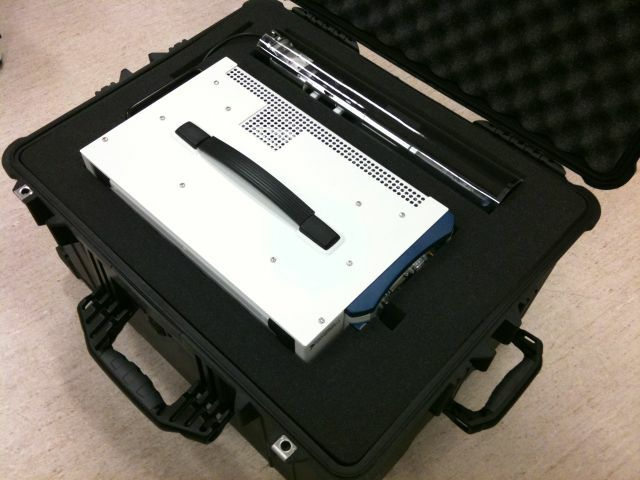 (right) The probe and the new control system fits nicely in a transportable suitcase making the hole system mobile. An high-end embedded quad-core controller. Three Source Measurement Unit (SMU) 100 Volts cards (PXI-4132). One DMM 7.5 digits, high-voltage multimeter card (PXI-4071). 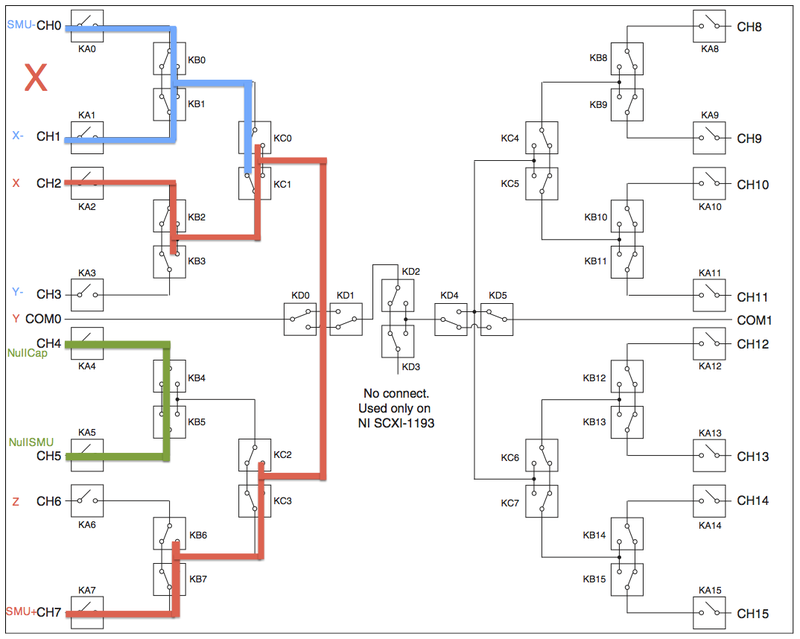 One multiplexer; mechanical relay switch card (PXI-2593). The Nanofactory probe (that fits a JEOL-2000fx TEM). 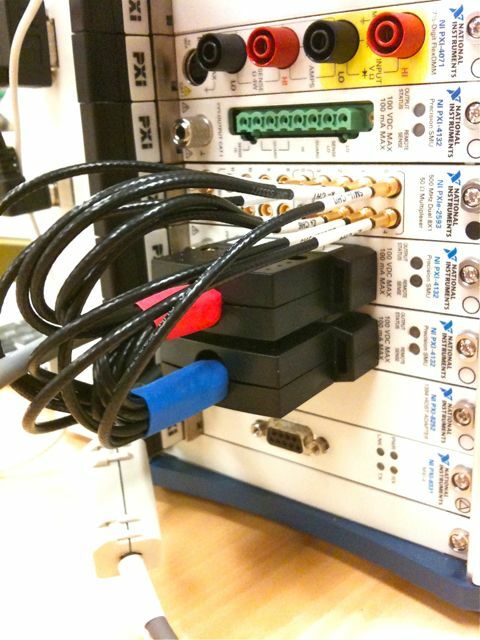 Figure 2, The PXI system from National Instruments being used for the probe control, here seen with the cables connected. The SMU cards supplies the high-voltage required to control the piezo-tube probe. The main purpose of the switch-card is to short-circuit the piezo after its being charged by the SMU's, assuring for the necessary quick physical return movement of the probe that makes the sliding motion function properly. Another advantage of also utilizing a switch-card is that the number of SMU-cards for the probe control can be reduced to a minimum of two. Capacitors are used to preserve charge on the piezo after that the voltage sources has been disconnected. This is possible due two the extreme low current consumption of the piezo. Well, the main advantage for this is that this specific card can supply 100 Volts, so two cards will give you 200 Volts, which is enough for controlling the probe. Other advantages of the SMU-cards is good accuracy and current sourcing capabilities, which could perhaps be used in a future experiment for controlling the piezo by the current-charging method instead of todays voltage method, this reduces hysteresis effect of the piezo. Also the SMU-card is nice to use as a bias-tool for the probe, if one has one extra card over the two already used that is. 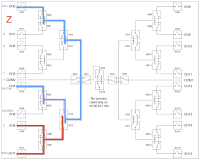 The main idea behind using a switch-card is to disconnect the voltage sources that have been used to charge the piezo-tube scanner and then discharge the piezo over itself, i.e. short-circuit it. Figure 3 shows the first setup tested which worked correctly. However it was soon realized that the grounding post was not needed and two voltage-sources where put in series to increase the supplied voltage up to 200 Volts. 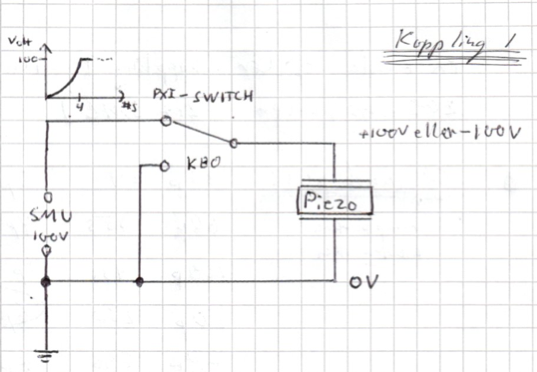 Figure 3, The main idea to use the switch to short-circuit the piezo allowing for a quick discharge. 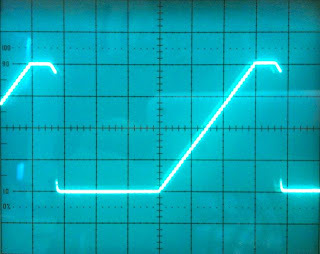 The SMU cards is connected by the switch cards to the piezo, the piezo is charged by a voltage ramping function, then disconnected followed by discharge over it self, figure 4 shows the oscilloscope view for a complete pulse, voltage ramp and discharge that is. Figure 4, Oscilloscope view of the pulses created by the SMU and switch cards. Timescale 5ms/square, peak-to-peak 200 Volts. The speed of the pulses can be increase up to a maximum of about 5ms/pulse. Nothing else can be made to discharge the piezo faster than this short-circuiting method, previously the "discharge" was made by dropping signal level on the source to zero as fast as possible, but this always gave slow discharge rates, fatal for the sliding motion, in which the probe will just vibrate and no sliding will occur. Some positive effect on the discharge speed was seen by manipulating the ramping function and switching from saw-tooth style to a more exponential looking style of the voltage-function, why this gives better results might be due to that more aggressive pulses easier travels through the often built in filters thats included in comercial hardware, but this is just a guess and has not been further investigated. For the new discharge method, ramp-function style seems to be of no importans. 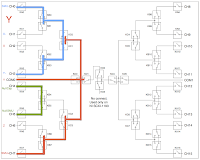 Two SMU-cards to drive five piezo channels? 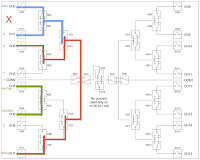 If a switch card is being utilized for the discharging of the piezo, it can also be used to reduce the number of voltage sources used for the piezo. Normally one would use one source for each channel, that is: two for x-direction, two for y-direction, and one for z-direction. 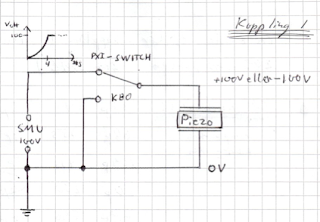 If you can store the charge on the piezo by utilizing capacitors you can then disconnect the voltage source from one channel and then switch to connect the source to another. Using capacitors is possible because the self discharging leakage current of the piezo is minimum especially if you run the probe in vacuum as you normally do. a few hundred nanoFarads would be enough to guarantee the preservation of charge of the piezo. (internal resistance in GigaOhm range when used in air) Figure 5 shows the connection of the capacitors to the piezo and the switch-card. Interestingly, by using this star-capacitor configuration one seems to get a more similar connection for the Z channel compared to the X and Y, thus with the capacitors one get what I called the missing Z- channel, so now there will be six instead of five channels: X+/-, Y+/-, and the new Z+/Z- channels. 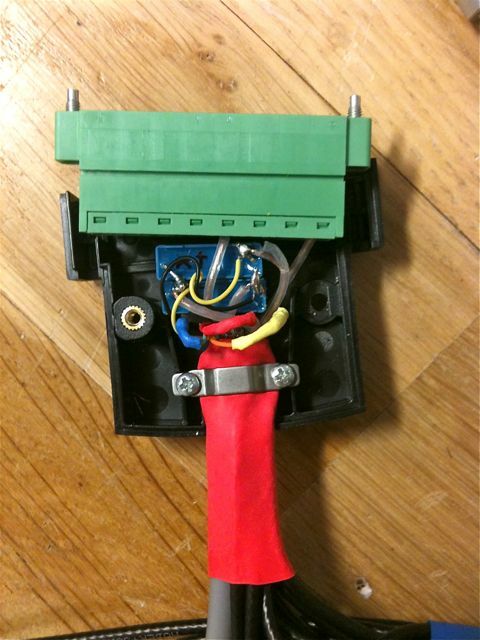 This simplifies connection and charging of piezo. Figure 5, The star-configuration of the capacitors connected to the five piezo-channels and the switch-card. 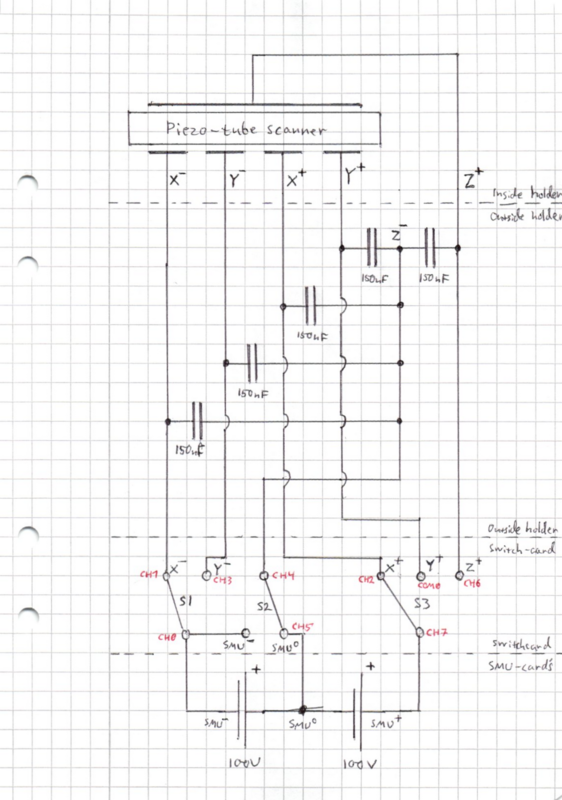 Switches shows schematically how to switch between X,Y, and Z movement direction of the probe. Now the Z channel consist of two connectors Z+ and Z-. If you study figure 5 in detail you will also notice that for the Z direction mode both SMU-sources can be used by reversing the direction of one of the sources and putting them in series with each other, giving a total of 200 Volts on the Z-channel, compared to the default which is one source and 100 Volts. 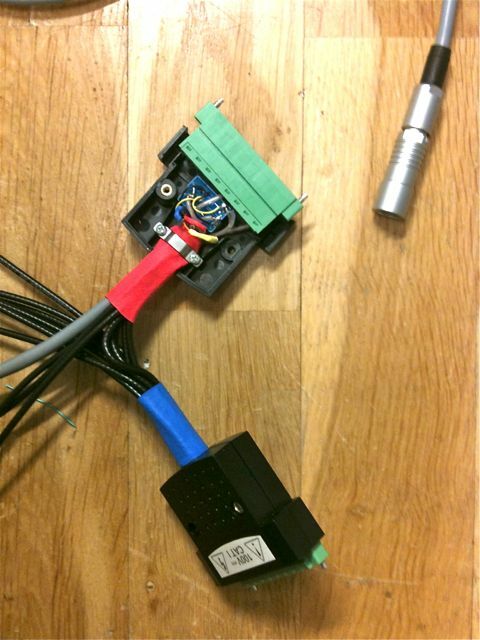 Figure 6, The connectors that connects the probe to the PXI-system. (left) two red and blue connectors for the SMU-cards, a bunch of MCX contacts that connects to the switch (not seen), the Fisher contact that connects to the probe (silver). 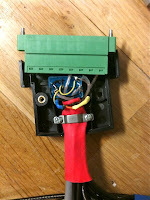 (right) The red connector disassembled showing that two of the capacitors has been hidden inside the connector, the other three capacitors are hidden in the blue connector this to assures a nice look of the cabling interface. Later I decided to make a change of the cabling by replacing the gray signal cable that goes to the probe with a bunch of individual RG174 cables for each signal, this improved signal/noise level somewhat. 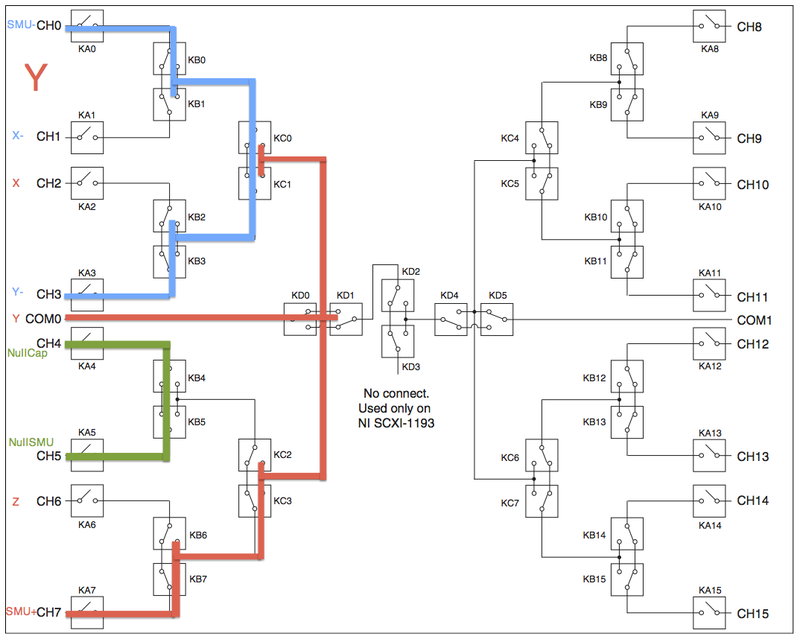 Figure 7, shows how to setup the internal relays in the multiplexer card depending on if one wants to run X,Y and Z mode. When running the software this will be transparant to the user and depending on which control the user uses the multiplexer card selects and jumps between proper configuration automatically. 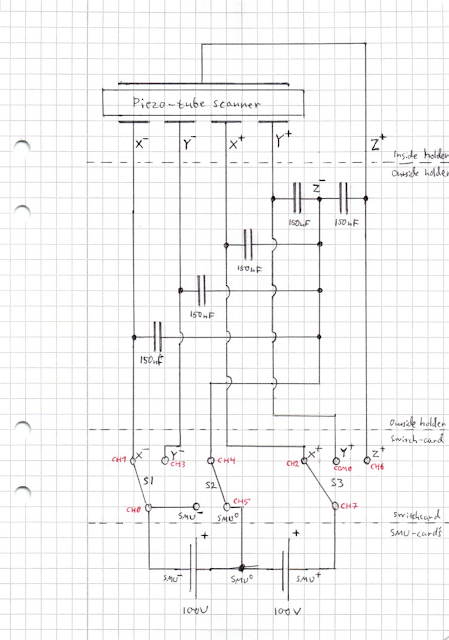 If you look att the schematics you see that one side or half the multiplexer is free for use, so controlling of other equipment or perhaps a double probe is a possible extension. The lifetime of the relays has been considered and according to the spec. 300.000/5.000.000 electrical/mechanical cycles are estimated lifetime so they should last for quit a long time. 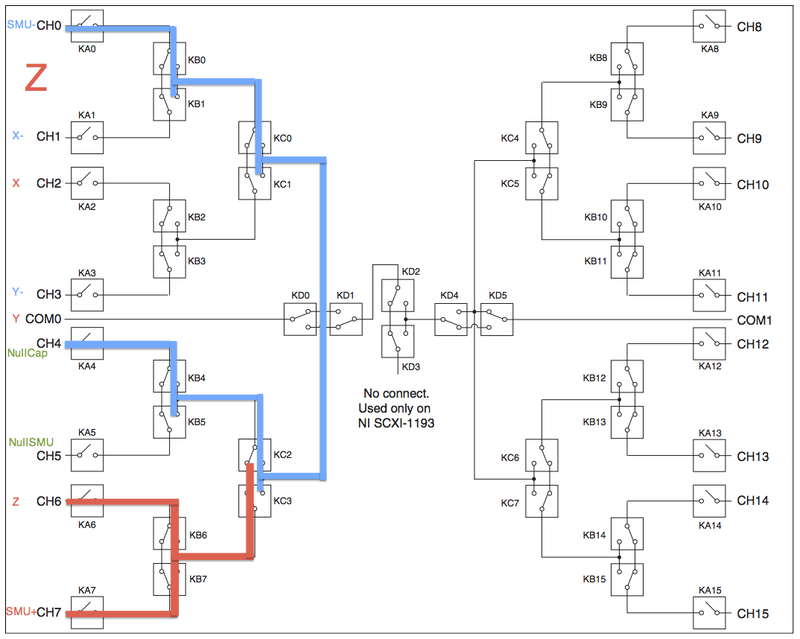 For information, now after that the development is completed the relay switching consumption has been up to around 50.000 cycles/relay and then the intertial sliding function was used all the time for testing in one months development time. The discharging current when short-circuiting the piezo has also been considered. By introducing extra capacitors, as done above, you introduce extra charge that has to be taken care of during the discharge of the piezo. The piezo which has a capacitance of around 1nF can therefore be neglected in contributing to the discharge current: if one uses two 100nF capacitors, neglecting the charge of the piezo and estimating the discharge rate to be 0.1ms at 200 Volts the short-circuit current level will be 400mA (mean value), the relays are constructed for 500mA breaking-current so it will probably be okay. If this will be a problem in the future, a current limiting resistor can be put in series with the relays, limiting the discharge current, but this will of course be at the expense of increase of discharge time. Better is to reduce the value of the capacitances, now I uses two 150nF capacitors, but according to test, se figure 8, lower values will also do. Inner resistance of the piezo is GigaOhm range so if one estimates the leakage current to be say 100pA then a 200 Volts charge over two 20nF capacitors will discharge by 1% over a time of 13 minutes and in that case the short-circuit current will be 80mA for the same short-circuit time period as stated above. Check out the movie on this subject at YouTube channel. The movie shows the first basic test of the coarse and fine movement of the probe in an few in-situ TEM experiment. Speed of probe in coarse motion (inertial sliding) is about 30-120 um/s. *, bad function in Z- direction to to wrong tension of the spider-leg springs. Springs were too soft during this test. Later test showed that good motion is achieved at voltage-levels from 140 volts and higher and that sliding still works down to 100 volts, this for all piezo channels. Discharge rate measurement of the piezo-probe by monitoring the probe position in TEM over time with different electrical configuration: constants voltage applied which shows the piezo hysteresis drift effect, zero nF (no capacitors used) the piezo discharge itself and starts to move, 1nF, 47nF to 470nF values of capacitances showing that the higher values is enough to keep the piezo from discharging over a time period of 10 minutes, figure 8. Figure 8, discharge rate of piezo tested for different electrical configurations. 47nF seems to be enough to prevent discharge of the piezo to that level that it will result in probe drift during the measurement time. The new TEM-SPM 3000 control system works and will now be used in future experiments. If monitoring the probe in TEM moving artefacts (drifts or jumps) can not be seen when switching between X,Y, and Z mode channels of the piezo. The probe also seems stable without drift for long time periods, except for piezo hysteresis that is. Later I will perhaps make a post about how the LabView software.